In 1864, Union forces led by General William Tecumseh Sherman set fire to Atlanta then carved a path of destruction 60 miles wide on their way to Savannah. Sherman's "March to the Sea" is widely recognized as the first act of "total warfare", intended to sap the willingness of the general population to support their troops, rather than achieve traditional military objectives. Not surprisingly, Georgia still remembers and resents the event with astonishing clarity, and mementos are on display in every town that suffered through it. But if the past is not forgotten, Georgia has hardly been held back by it. 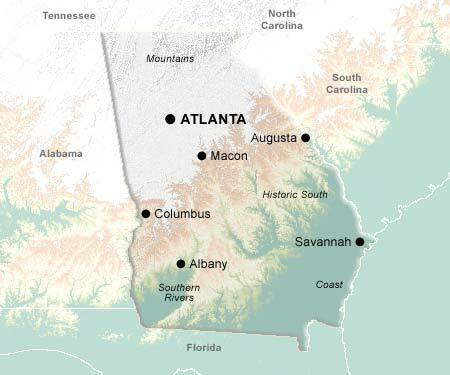 Today's Atlanta is a cosmopolitan, diverse city -- the emblem of the "New South". Half the jobs in Georgia are located in the Atlanta Metropolitan area, and Atlanta Hartsfield International Airport Airport vies annually with Chicago's O'Hare for the title of "World's Busiest". Atlanta offers world-class restaurants and night-life, and sporting facilities that have hosted the Superbowl, the World Series, and the 1996 Summer Olympics. Outside Atlanta, the pace of life in Georgia slackens, and the Old South of Hollywood legend lives on, at least in pockets. Savannah is noted for its antebellum mansions; its 21.5 square mile historic district is one of the largest in the US. Georgia's numerous wilderness areas include the famous Okefenokee National Wildlife Refuge, plus the Chattahoochee and Oconee National Forest. The Lake Oconee region is also a golfing mecca, home to seven championship courses.